Alfred University is a small, comprehensive university in the Village of Alfred, Allegany County in Western New York, United States, south of Rochester and southeast of Buffalo. Alfred has an undergraduate population of around 2,000, and approximately 300 graduate students. The institution has five schools and colleges. The Steinheim Building ("the castle") houses the Career Development Center. Alfred was founded in 1836 as the Select School by Seventh Day Baptists as a non-sectarian institution. Unusual for the time, the school was co-educational. It was also racially integrated, and enrolled its first African-American student and two Native American students in the 1850s, becoming the second college in the nation after Berea College in Berea, Kentucky, to do so. The origin of the name "Alfred" is uncertain. Residents of the town and students at the two schools believe that the town received its name in honor of Alfred the Great, king of the Saxons, although the first documented occurrence of this connection was in 1881, 73 years after the first record of the name being used to describe the geophysical area during assignments by the state legislature. State records which might have verified the connection between the Saxon king and the university were lost in a fire in 1911. Regardless of whether the connection is historically accurate, Alfred University has embraced King Alfred as a symbol of the school's values, and a statue of the king stands in the center of the campus quad. Since its founding, Alfred University has hosted guest lecturers, artists and musicians from Ralph Waldo Emerson to Ghostface Killah. In April 2000, Alfred University received national attention when freshman, Eric Zuckerman, orchestrated a campus visit from then–First Lady, Hillary Clinton, during her campaign for the United States Senate. Alfred University, together with Corning Incorporated and the State of New York created the Ceramic Corridor, a high-tech incubator project designed to take advantage of the emerging ceramics industry and to create new jobs. This unique industrial development program is the only one in the United States concentrating on one single aspect of technology – high-tech ceramics – and it is the only major industrial development project centered in a rural area in the U.S. Extending to the 20th and 21st centuries, Alfred has continued its progressive history of defending equal rights for members of the community. In 1971, Alfred became only the fourth municipality in the U.S. to ban employment discrimination based on sexuality. In the mid-1990s, the university became one of the first to strip credit for ROTC programs, which exhibit prejudice on basis of sexual orientation. However, students attending Alfred University are still free to receive an Army ROTC contract with full tuition paid and attend military science classes through St. Bonaventure University. Amidst the dissolution of the AU Greek System, the Lambda Chi Alpha fraternity chapter at Alfred University led an overwhelmingly successful effort to ban discrimination based on religion, age, disability, and sexual orientation in the constitution of the 210 chapter international fraternity in 2002. That action triggered several other national fraternities and sororities to follow suit. Originally built in 1884, Kanakadea Hall served as Alfred's schoolhouse until a large fire destroyed the tower and devastated the second floor in 1907. It was sold to Alfred University and repaired in 1908. The exterior has since been restored to its original appearance, although the interior has been fully modernized. The building now houses the Division of Human Studies. The statue of King Alfred stands at the center of AU's quad, and is often decorated by students. In this picture, he is wearing one of the purple shirts worn by student Orientation Guides (OGs) during the 2006 freshman orientation. Alfred University is not to be confused with the Alfred State College. Although autonomous, both institutions have their origins in the Alfred Select School, and were heavily shaped by Boothe C. Davis. In 1908 Davis petitioned the New York State Legislature to fund the New York State College of Agriculture at Alfred University. In 1941 Alfred State College became an autonomous junior college due to increased enrollment and increasing needs, which Alfred University could not accommodate, and in 1948 became a member of the State University of New York (SUNY) system. Students of both schools still share a few Alfred peculiarities including: a physical education requirement for most programs, a short break in October dubbed "minibreak", sharing of clubs and organizations (excluding Greek lettered organizations), and cross-registration of classes not offered at the other institution. Alfred University's mascot is the Saxon, a knight in shining armor. Since the year 871 is when King Alfred the Great succeeded his brother, Ethelred I as King of Wessex and Mercia (see Alfred the Great's childhood), the telephone exchange of Alfred University is 871 (i.e., all AU phone numbers take the form 1-607-871-xxxx). Hot Dog Day is held in early April of each year since 1972 at Alfred to raise money for local charities and community-based civic organizations. It is a joint project with Alfred State College coordinated by students and staff from both schools. Typical events include a carnival, small amusement park rides, mud olympics, concerts, a parade, and the consumption of hot dogs. In recent years approximately $7,000 to $8,000 has been raised for charities including the local fire departments, public library, and day care centers. Alfred's Davis Memorial Carillon, erected in 1937 as a tribute to longtime president Boothe C. Davis, can often be heard while on campus. The bells of the carillon, purchased from Antwerp, were thought to be the oldest bells in the western hemisphere. Research later (2004) showed that the bells were of a more recent vintage, and that Alfred had been the victim of a fraud. On the brighter side, the non-historic nature of the bells allows the university to replace those that have poor tonal quality. Concerts continue four times a week when school is in session (Monday, Wednesday, and Friday at 12:30 pm and Saturday at 4 pm), and during the summer months at least once a week. Besides the resident carilloneur, guest carilloneurs have in the past frequently visited and played during the summer. The Black Knight has been a part of Alfred University folklore for a long time. The relic was originally part of a parlor stove in a classroom in Kanakadea Hall. When the stove was discarded, the figure was claimed by the Class of 1908 as their mascot. They passed it on to the Class of 1910, thus causing a "war of possession" between the even and odd numbered classes. Many times over the years it disappeared and re-appeared on campus. After a particularly long time away it was returned in 1977 and placed in the University Archives. In 2005 it was transferred to a glass case in the Powell Campus Center along with a plaque describing its history. Many students had heard of the Black Knight during their freshmen orientation and were delighted to have him on display. However, after only a few months, the glass enclosure was destroyed in the middle of the night and the Black Knight stolen. Alfred University was mentioned on Saturday Night Live once in 1975 by host and Alfred University alumnus Robert Klein. When Klein hosted SNL again in 1977, he talked at length about Alfred University in his monologue. Alfred is especially well known for its programs in ceramic art, ceramic engineering, glass engineering, and has a strong astronomy program due in part to the presence on campus of the 7-telescope Stull Observatory, which has one of the largest optical telescope in New York state. Asteroid 31113 Stull was named for John Stull, founder and caretaker of the observatory. There are two libraries on Alfred's campus, the Herrick Memorial Library, which primarily serves the private colleges, and the Scholes Library, which primarily serves the New York State College of Ceramics. The Alfred Ceramic Art Museum has a collection of 8,000 ceramic objects, including both ancient and modern ceramic art and craft. The Bromley-Daggett Equestrian Center, located at the Maris Cuneo Equine Park, was constructed in 2005. It hosts equine classes, an intramural equestrian team, varsity and JV for both English and Western disciplines, clinics, and horse shows. Stalls are available for boarding by university students. The facility has an indoor arena of 16000 ft² and lighted outdoor arenas of 28,800 and 10,800 sq ft (2,680 and 1,000 m2); the entire property consists of 400 acres (1.6 km2) of land. The Miller Performing Arts Center was dedicated in 1995. Now used primarily to house the Admissions Department, Alumni Hall has a place on the National Register of Historic Places. The former University academy building, with cathedral ceilings, and offices far up into the cupola is a beautiful example of 19th-century American architecture in Alfred. In the 1990s, Alumni Hall was saved through a restoration effort. Alfred University was once associated with the Seventh Day Baptist Church, and included a school of theology. While the religious connection no longer exists, the architecture of Alumni Hall and other buildings on campus reflect this heritage. Alfred University offers over 60 majors and areas of concentration at its four colleges and schools. Alfred's four private colleges are The College of Liberal Arts and Sciences, The College of Professional Studies, The Inamori School of Engineering, and The Graduate School. The School of Business is part of The College of Professional Studies. The New York State College of Ceramics (NYSCC) consists of the School of Art and Design, with its own dean, and four state-supported materials programs cross-organized within Alfred University's School of Engineering. The College of Ceramics is functioning technically as a "holding entity" for the fiscal support of the state programs and the NYSCC mission. The unit head assists with budget preparation for the two aforementioned AU schools and the NYSCC-affiliated Scholes Library of Ceramics (part of the campuswide, unified AU library system), and acts in a liaison role to SUNY. The School of Art and Design, technically a sub-unit of the College of Ceramics but autonomously run with its own dean, is further subdivided into divisions. A visit to the school in 2009 led media historian Siegfried Zielinski to state that Alfred is "the center of alchemy for the 21st century." Alfred's School of Engineering (also autonomously run with its own dean) currently has four state-supported programs and two privately endowed programs. Alfred University and The New York State College of Ceramics (NYSCC) are associated with five galleries: Alfred Ceramic Art Museum, The Cohen Center for the Arts Gallery, The Fosdick-Nelson Gallery, Robert C. Turner Gallery, and Institute for Electronic Art's (IEA) John Woods Studios. Other mentionable exhibition spaces for undergraduate and graduate students to show work include the Sculpture Dimensional Studies Exhibition Spaces (the Cube, the Box and the Cell Space), the Printmaking Critique Room, Flex Space, the New Deal, and Rhodes Room. Work from permanent collections are also on exhibition in the Saxon Inn and around campus in the offices of faculty. NYSCC is host to the John Wood Studios of the Institute of Electronic Arts (IEA) within the School of Art and Design (SoAD), NYSCC which offers a residency program for up to two weeks for international artists. Fraternities and sororities were established at Alfred University for nearly 100 years prior to 2002, when they were discontinued, partially in response to the death of Zeta Beta Tau (ZBT) fraternity member Benjamin Klein under suspicious circumstances and charges of gross negligence on behalf of the fraternity. Prior to Klein's death in 1978, student Chuck Stenzel died in a hazing-related incident at Alfred's Klan Alpine fraternity. After Stenzel's death, his mother, Eileen Stevens, created a lobbying organization to increase awareness of hazing and promote anti-hazing laws, as documented in Hank Nuwer's book "Broken Pledges" and a later TV movie of the same name (in which Alfred was not named for legal reasons). Stevens later served as an advisor to Alfred on hazing-related issues, and received an honorary doctorate from the school in 1999. During the summer of 2002, all Greek social organizations lost recognition after an in-depth analysis of the Alfred University Greek system by an eight-member task force appointed by the Board of Trustees. More than 50% of the task force were themselves members of a fraternity or sorority while in college, and 82% of the Board of Trustees are Alfred University alumni. At the time of closing in 2002, the Greek system at Alfred University included national and international fraternities Lambda Chi Alpha, since 1909, Sigma Alpha Mu, Kappa Sigma, Alpha Chi Rho, Delta Sigma Phi, and Zeta Beta Tau; as well as local fraternities Kappa Psi Upsilon, and Klan Alpine. The sororities included Delta Zeta, Theta Theta Chi, Alpha Kappa Omicron, and Sigma Chi Nu. The overall Greek community made significant contributions to Alfred University, Alfred, NY, and the surrounding communities, such as annual food drives that raised more than 2,000 lb (910 kg) of food each fall for the Hornell food bank. Hot Dog Day Weekend, one of the largest and most successful community gatherings in Alfred, was created by the brothers of Lambda Chi Alpha, as a way to raise money for charity efforts. The event was organized and run by the fraternities and sororities at Alfred University for nearly 30 years. Many of the societies have highly active alumni associations, some of which gather at Alfred University reunions, or at independent functions. Alpha Phi Omega is still recognized, as are academic fraternities, because they do not fall under the same category of restrictions as social fraternities. As of 2010[update], Alfred has over 90 student organizations and clubs. Student media include: AU TV, the Kanakadea Yearbook, and WALF 89.7FM. AU has been granted chapters of a number of honor societies, including Phi Beta Kappa (the Alpha Gamma chapter of New York, granted in 2004), Phi Kappa Phi, and Alpha Lambda Delta; Alfred also has chapters of the service societies Alpha Phi Omega and Omicron Delta Kappa. Other honor societies include Alpha Iota Delta, Beta Gamma Sigma, Delta Mu Delta, Omicron Delta Epsilon, Pi Gamma Mu, Pi Mu Epsilon (the Alpha Iota chapter of New York, chartered in 2002), Pi Sigma Alpha, Sigma Tau Delta, Tau Beta Pi, Phi Alpha Theta, Phi Sigma Iota, Psi Chi, Keramos, and the Financial Management Association. Alfred teams participate as a member of the National Collegiate Athletic Association's Division III, with the exception of alpine skiing which is governed by the USCSA and the equestrian team which is governed by the IHSA. The Saxons are a member of the Empire 8 Athletic Conference (Empire 8). They compete in the following sports: alpine skiing, basketball, cross country, equestrian, football, lacrosse, soccer, swimming and diving, tennis, and track and field, women's volleyball, and women's softball. ^ Alfred administers the New York State College of Ceramics. ^ "U.S. and Canadian Institutions Listed by Fiscal Year 2016 Market Value of Endow" (PDF). NACUBO.org. Archived from the original (PDF) on February 15, 2017. Retrieved March 24, 2017. ^ "Alfred University Board of Trustees names Mark Zupan as institution's 14th president" (Press release). Alfred University. February 11, 2016. Retrieved July 9, 2016. ^ a b c "Alfred University". College Board Profiles. College Board. Retrieved August 12, 2007. ^ "Alfred University Visual Identity Standards" (PDF). Alfred University. Retrieved August 3, 2016. ^ "History of AU". Herr.alfred.edu. October 25, 1990. Archived from the original on March 12, 2012. Retrieved April 15, 2014. ^ Strong, Susan (1997). "Alfred's Town Name". Herrick Library Special Collections and Archives. Archived from the original on July 19, 2007. Retrieved August 12, 2007. ^ Lewis, E. H. (2007). Allen of Alfred: Some of His Words. Kessinger Press. p. 19. ISBN 978-0-548-05765-0. ^ "Community: Events: Hot Dog Day 2011". Alfred University Website. AU ITS. Retrieved April 20, 2011. ^ Windmeyer, Shane L. (1998). Brotherhood: Gay Life in College Fraternities. Alyson Publications. ISBN 1-55583-409-4. ^ Alfred University. "The Edward G. Coll and Carole Hulse Coll Center at Kanakadea". Alfred University Campus Map. Retrieved April 27, 2008. ^ "SNL Transcripts: Robert Klein: 11/15/75: Robert Klein". Snltranscripts.jt.org. Retrieved April 15, 2014. ^ "SNL Transcripts: Robert Klein: 01/21/78: Robert Klein's Monologue". Snltranscripts.jt.org. Retrieved April 15, 2014. ^ "Alfred University - College of Liberal Arts and Sciences - Physics & Astronomy". Las.alfred.edu. Retrieved April 15, 2014. ^ "Miller Performing Arts Center wins international recognition" (Press release). Alfred University. February 5, 2003. Retrieved September 17, 2007. ^ Edizel, Gerar (2009). "Process is Concept", p.3. St Vincent Press, Rochester, NY. ^ "What part, if any, can and should the art world play in revitalizing people of a perhaps degenerative culture, a culture in which people seem to be morally soft, often, and unaware of their actions, insensitive to the moral religious values in situations. Have not art and those people who know its value more to say than they have said, not only to make art a more vital and integral part of community life, but to minister to the spiritual needs in the broadest sense of the term?" ^ "Alfred University implements new requirements for Greek organizations" (Press release). Alfred University. February 18, 2002. Retrieved August 12, 2007. ^ a b "Alfred University trustees vote to eliminate fraternities and sororities" (Press release). Alfred University. May 20, 2002. Retrieved August 12, 2007. ^ a b "Student Life: Clubs and Organizations". Alfred University. Archived from the original on November 19, 2010. Retrieved December 23, 2010. ^ "Phi Beta Kappa at Alfred University". Alfred University. March 2006. ^ "Mathematics: Student Organizations". Alfred University. Retrieved December 17, 2008. ^ "Honor Societies". Alfred University. Archived from the original on December 21, 2008. Retrieved December 17, 2008. ^ "Alfred University Saxons". Archived from the original on December 23, 2010. Retrieved December 13, 2010. This article incorporates material from Statutory college. 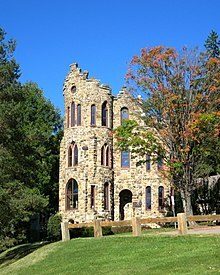 Wikimedia Commons has media related to Alfred University.